I love IKEA. You can’t beat the prices and I think their reputation for low quality goods is undeserved. Many of the items we bought at IKEA has held up quite well in comparison to furniture that I we bought at Crate and Barrel. And the design is wonderful. Even though we can afford to buy furniture from other places we always buy IKEA because we love the way it looks. When it came time to redo our bathroom we decided to go with the Ikea GODMORGON Cabinet ($199 + extra for the legs) and mirror. The brilliant design allows you to have two full size drawers. It gives you tons of storage and comes with neat little dividers. We chose a BRÅVIKEN sink to go with it ($179.00). The sink is really shallow and wide. Its an interesting design and very european/modern looking. And for our faucet we chose GRUNDTAL ($89.99), a sleek faucet with a neat mechanism for turning the water on and off. We started by assembling the cabinet. Pablo and I are pros at this by now and it went quickly and easily. I was impressed by the quality of the materials. Then came time to connect it to our plumbing and this is where it all went very wrong. We got under the cabinet and removed all of the old plumbing. I assembled the PVC pipes that came with the Braviken sink and realized very quickly that the pipes are much narrower than the metal ones that we had previously. Stymied, I started assembling the faucet since I already know how to change a faucet. To my chagrin I realized that the connectors were not the same size as what I had previously AND the cords were too short! I went to IKEAfans to see if any advice could be found and I found some posts warning people about the fact that the connectors will not work with American plumbing. You would think that IKEA would perhaps warn you of this! (And yes, I realize that the world is metric except the USA, but that is besides the point). Here is what the drawing the manual looks like. As you can see there are no instructions on how to connect the end of the pipe (bottom left) to your plumbing. IKEA considers that to be 100% your problem. In their defense, everyone’s plumbing is different, so they have no way of knowing what you have. I made a call to my local hardware store and they suggested that I try Brother’s Plumbing Supply in Elmsford. I made the trip out and thankfully, they knew EXACTLY what to do. The Grundtal faucet has a 1/2″ IPS connector, my old sink uses 3/8″ compression fitting. So I needed an adapter/extension shown below. The brass part is the adapter which I guess allows me to connect the two female parts. The adapter is the webbed hose part. And for the waste pipe I needed a reducing nut and washer. What you do is put the rubber washer on the smaller IKEA supplied pipe. Then put the nut on it. Screw the nut into the waste pipe that you have and voila, it fits! Total cost of materials was $19.00. And here is a pic of it all put together! Your hot/cold shutoff pipes are short. Ours protude 4.5 inches from the wall. Further out, and you will not be able to open and close the drawers in the Godmorgon cabinet.We were fortunate that our hot/cold pipes are relatively flush against the wall. If they had stuck out another inch or two the sink would not be touching the wall. And who wants a sink that is 1″ away from the walls? You are replacing something that is the same width as your current vanity. This goes for any sink. The faucet and the drain hole need to be located in line with your waste line. Steve’s Blog – He explains how to install an Ikea faucet. Parkerman’s photos on Flickr – I found this on IKEAfans. He discarded the pipes that came with the Braviken and did it with American fittings. PS Today, while at the plumbing store, I learned that this is not called a “Monkey Wrench”. Its called a pipe wrench. They guys at the store were both offended and amused that I used the term which is an anachronism. How about some pics behind the drawers to see how your drain pipes are hooked up? 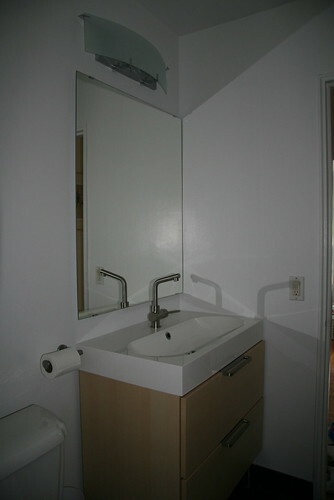 Just wanted to thank you for taking the time to write about your experience with the Ikea sink and Godmorgon vanity. I am considering a configuration similar to what you have, and am grateful to have your really helpful review, comments, and lessons learned. I would be interested to know, given that it has been installed for almost a year now, how the vanity is holding up? Has it stood up well to normal use thus far – drawers opening and shutting well, surface still looking nice? I’d also be interested to know how you like the faucet, and if that is holding up well, both functionally and re: the finish. The finish on the sink is not holding up that well after 4 years. But overall, I am happy. Thank you for your detailed explanation! Super helpful! One question though… would this sink work with a 3 hole faucet based upon the plumbing issues that you incurred? How many holes come drilled in the sink itself? I think there is only one hole for the faucet. Wish I’d read your blog first! Managed to find parts for the supply line issues – but hooked up Ikea’s small pipes to 1 and one-half inch pvc pipes – but then door slide hardware and drawers wouldn’t fit — nightmare! Now have to cut it all out and start again. Anyone considering this needs to know that you only have a safe 3 inch clearance from the wall to the drawer hardware! I could have bought a $4,000 real wood vanity by now for all the time and extra supplies spent on getting this to work – and I’m not finished yet! I installed my pipes sideways and they still work. No drainage issues. I was not able to get the piece to be flush against the wall however. it sticks out a bit from the sink. Is the cabinet against the side wall or did you use a filler? I’m concerned that the drawer won’t open fully since I have the door trim on the way. I also see that you have the door trim to the right of your cabinet. I’m adding a granite top and a square ceramic vessel sink, do you think that cabinet will hold the weight of the granite if I install the legs on the cabinet? It is against the side wall. Nice post. Glad someone is warning people about the potential pitfalls with these vanities. As for your second bullet under “don’t buy unless…”: The sink drain hole does not need to be in line with your waste line. The pipes that come with the sink are quite configurable. Hi. LOVE this blog, and like other posters, I just wish I’d seen it before buying the Godmorgan and ripping out my old stuff. I have almost the exact same unit as you do, going into a very similar spot. My qustion is to rehash your Q&A with Lorena. Is your cabinet really flush to the wall on the right? And if so, how does the drawer open? I’d been considering adding some trim pieces to shift the cabinet left 1/4 inch, but I’d much prefer to keep it flush. Can you explain or maybe even send a close-up of that right side? ps- It’s 11pm ET on Wednesday night. I’m assembling my cabinet now, and planning to install everything on Saturday. Thanks very much for your great blog. This reply is embarrassingly late. The drawers are inside of a frame that is around 1 inch wide. So the drawer easily clears the door frame. I wish I had read this before I bought the sink and vanity. I have the problem where my drawers will not close bc of the protruding pipes. We have to now do an IKEA hack and cut/modify the drawers to make it fit. Wish I had known this so I would not have bought the set and now it’s too late to return it. Cool job. Looks like your assembly went well and fast. I am trying to install the godmorgon and the drawers don’t sit well. The first one seems to be where it should (slightly below the frame, so its not in the way of the sink). But the bottom one blocks the top one. Not sure what I am doing wrong. Do you have ideas to help me? Did you install the drawer tracks right side up?